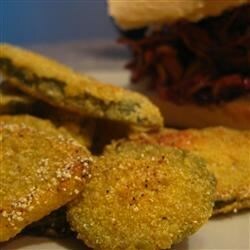 "Who would have thought that pickles could taste so good fried? Partner them with Cajun buttermilk ranch dressing for dipping. Yum!" These tasty fried appetizers are a Southern favorite—and so easy to make! This was perfect and exactly what i was looking for. I did not have buttermilk, so i used regular milk insted. MY husband and kids loved them. Very good ! I did not use the spices. The cornmeal gives it crunch !